Until recently, Toronto’s Sheppard Avenue was the busiest road in Canada. This changed in 1998, when an invasion force descended upon the avenue, erecting chain-link fences and wooden barricades, constructing command outposts, excavating trenches, driving around in their tank-treaded vehicles and ripping up the road and the land surrounding it into tiny little pieces, all the while barking orders and yelling at passersby in strange foreign tongues. Toronto was preparing to give birth to its third subway line, and in preparation a series of wombs and tubes had to be put into place. Five mighty pits would be excavated across the line. Sometime before the end of the six-year gestation period, the five embryonic pits would develop into five strong subway stations linked by several long chains of square and tube tunnels. Like most Toronto subway stations, the new stations will be named after the roads they bisect: Yonge Street, Bayview Avenue, Bessarion Road, Leslie Street and Don Mills Road. Construction of the new 6.4-km line will cost an estimated $875 million, for a grand total of $137,000 per meter. Waiting two years to peek in such fabulously ritzy tunnels was unthinkable, so I headed down to take an ultrasound. Although I’d been eagerly watching the construction crews for some time, my first trip into the new system was unplanned. It was about 8p.m. and I’d finished visiting a friend at Yonge and Sheppard. I noticed that the normally teeming construction site was completely unpopulated. I wasn’t dressed for it or equipped with a proper flashlight, but I couldn’t really resist, so I pulled back a flimsy orange rubber fence and slid through. I waded through the soggy mud until I found a slope leading down into the pit. I slipped and slid most of the way down, but climbed down a few ladders as well where these were provided. The tunnel  well, I suppose it’s more of a pit than a tunnel, but it’s a very deep, very narrow and partially covered pit  is about 12m deep. 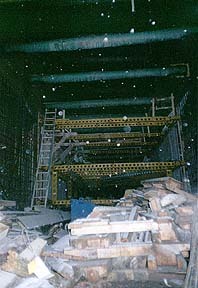 The top of the pit was covered in thick metal tubes. Cement had just begun to be poured into the tunnel in sections, but mostly I was walking through mud or on sheets of plastic. There were a fair number of structures to climb around on but nothing really fascinating. After touring for a while, I climbed out via a series of very shaky makeshift wooden ladders. Final analysis: a pit filled with mud. Final verdict: cool. I kept an eye on the developments at Yonge and Sheppard over the following weeks, as more and more construction vehicles moved into the neighbourhood and more and more pits were dug. On one occasion, while my friend Scumbone and I we were investigating the pits in hope of finding the spot where the pits linked up to the tunnels, a man with a flashlight wearing a yellow windbreaker ran by us on the outside of the fence. We wondered if he was a jogger or a security guard in a rush to come arrest us. Luckily, it turned out he was the former, and that experience was a helpful reminder that our flashlights could be used to make us look a little more official. Hauling out some flashlights, we gazed down into the pit beneath us and determined that it was entirely muddy and flooded and just generally not for us. Further investigations of the pits and minor tunnels around Sheppard proved equally unexciting, so we proceeded to the east. through the large viewing hole and take a gander... all that is missing is "U". Shifting my attention from the westernmost point on the line to the easternmost, I next fixated upon the vast construction site that sprawled across all four corners of the intersection at Don Mills and Sheppard. Scumbone and I left her car in the parking lot at the nearby Fairview Mall and began circling the well-barricaded perimeter in search of a subtle entrance. 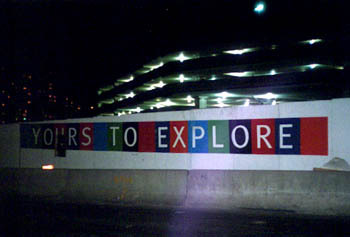 Failing to find one, we instead hopped through a largish viewing hole in a wooden barricade that read “Fairview Mall: Yours to Explore.” Immediately on the other side of the hole was a breathtaking pit (you really don’t see those two words used together often enough these days, do you?) that redefined my understanding of the term deep excavation. Beyond the half-meter of standing room around the perimeter, the hole plunged directly down approximately six storeys underground, where tiny-looking halogen lamps lit up the cement- and steel-coated underworld. 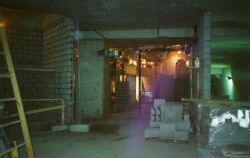 Six storeys underground in the future Don Mills station. About this time, I spotted another cement tunnel about halfway up the pit wall that I wanted to investigate. There were no ladders handy, so I climbed up the yellow scaffolds to take a peek. It was just a short pedestrian tunnel under Sheppard  a little flooded and not incredibly interesting  so I climbed back down, making a fair amount of noise as I did so. I was just conveying to Scumbone my delight with the brand name of the scaffolds (Super Stud) when suddenly a distant voice yelled down at us, “What are you doing down there!” I scanned around the rim of the pit seven storeys above, spotted the guard and yelled back “Just lookin’ around, do you want us to leave?” He yelled back, “Do you want me to call the police!” I yelled back, “No, we’ll leave,” and Scumbone and I made our way out the same way we’d come in. I pouted as I applied my moist towelette. I had to wait a whole week before I got my next opportunity to head down into the Don Mills pit. After meeting up with Leftist and his friend Sara at Fairview Mall, I lead them to the oversized viewing hole I’d used the week before and coaxed them through. 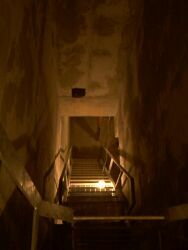 We descended the stairs to the bottom of the pit and I showed them around a bit. After peeking in on the blueprints, we continued to the west, crossing under the wooden boards supporting all the traffic on Don Mills seven storeys above. We came upon a large lake of wet cement, which we were able to circumvent without leaving tracks. The next hurdle was a vast, wet pit covered only by thin, crisscrossing metal bars. Sara and I tightrope-walked across these with relative ease, but the balance-impaired Leftist had quite a bit of trouble making it over. After the pit, we next entered a wide expanse of sand dunes and pits, and a fleet of small bulldozers and forklifts, which we somehow resisted using as bumper cars. Leftist prepares to hop inside the TBM. Leaving the sandy area, we came upon a tall wooden fence. We pried back one of the boards to reveal a large support wall with a gigantic tunnel boring machine (TBM) sticking out of it! It seemed the TBM had just that day broken through from the Leslie tunnels into the Don Mills pit. After a few photos of the outside of the TBM, the three of us hopped through a gap in the tube wall to investigate the TBM and its lair. After another look at the TBM, I persuaded Leftist and Sara that we should walk down the tunnel towards Leslie. Our progress along the tracks was very slow, as the sloppy grey muck at our feet was quite deep, and there were no boards running along the side of the tunnel to make our journey easier. Earlier, we had decided we’d use standard tunneling excuse #4 (“I dropped my keys”) if we were caught inside the pit. Now that we were about $2,740,000 (20 meters) inside the tunnel, I mentioned to Leftist and Sara that excuse #4 probably wouldn’t be very helpful anymore. We’d travelled about $13,700,000 (100 meters) into the tunnel when Leftist declared that he needed a rest. While we waited, I thought I heard a voice off in the distance. Straining my eyes to see as far down the tunnel as possible, I thought I saw a vaguely humanoid figure wearing a hardhat, but I had to stare intently for several moments to determine that it was moving. I guess the worker felt my stare, because just then he started yelling at us, though we were so far away that I could barely hear his voice, let alone make out his words. I turned around to face Leftist and Sara, who were absorbed in conversation and hadn’t noticed the turn of events. In a voice that made it very clear I wasn’t joking, I said “I think we should make as hasty a retreat as possible.” I explained the details as we fled back up the tunnel. Sara was almost running along one rail, I was hopping from board to rail to board, and Leftist was simply trudging along through the shallow muck at the side of the tunnel. As we retreated, I took out my pocket flashlight and flashed it behind us three times, in the way that I’ve seen TTC workers do to one another when they spot each other from a distance inside the subway tunnels. I hoped this might confuse the workers enough to keep them from calling TTC security or the police. Before long we were back at the TBM. As I jumped out of the side of tunnel into the pit beyond, a loud voice came over a radio calling out in Spanish or Italian. Had the workers assumed we were co-workers because of the flashlight trick? There was no time to speculate. The three of us hopped onto a temporary orange staircase near the end of the pit and raced up seven storeys to the surface. We then crawled along a support beam and climbed through a wooden fence to step back on solid ground. No police cars or security vehicles seemed to be waiting for us, so we quickly exited through a gap in the fence and began to stroll along Sheppard, looking completely innocent aside from being coated in grey muck from the knees down. We strolled down the road to the Leslie construction site, where we admired the construction crew dumping huge vats of wet cement into the pit below, and did a little more Leslie-area reconnaissance before hopping on a bus and heading elsewhere. It struck me as strange that the construction around Leslie and Sheppard, in the middle of the line, seemed to be so much more extensive than elsewhere. The gates and fences extended from far to the west of Leslie to far to the east, with multitudes of large pits, cranes and construction vehicles on both sides of Sheppard. It seemed that something special was happening at Leslie. Scumbone and I arrived late at night and started at the northeasternmost pit on the lot, easily rolling underneath a large gap under the chain link fence that surrounded the site. We made our way down the piles of crushed rock that surrounded the pit, and at the bottom found ourselves faced with one very large cavern dug into the earth, atop three much smaller cement tunnels that looked very much like storm drains. Some unpleasant-smelling water was being piped into one of these tunnels. We climbed up to investigate the cavern first, but found it didn’t go very far before ending at a large blue tarp. Climbing back down, we hopped into the middle of the three drain-like tunnels, and crouched down low to follow this muddy-bottomed tunnel for about 15 minutes before it spilled out on the south side of Sheppard into a deep, murky pool. We didn’t feel like swimming, so we groaned and made our way back out the way we’d entered. For our next trick, we crossed to the south side of Sheppard to look for any weaknesses in the tall chain-link fence around the perimeter of the main pit. We didn’t have to look hard at all, as there were quite a few places where it was easy to slide between two sections of fence that had been poorly linked together. 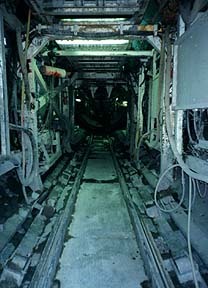 We climbed down a couple of ladders and caught our first glimpse down at the brightly lit concrete chamber at the very bottom of the pit, which I assumed was the beginnings of Leslie Station. This looked to be the furthest-along section I’d peeked at so far, so I was quite excited as I started the descent down the long metal ladder. When I was about halfway down, though, I saw that the square tunnels stretched out of sight in either direction, and yelled “Wow!” louder than I should have. Unlike the sections to the west, the Leslie tunnels were very brightly lit with loudly humming halogen lamps. 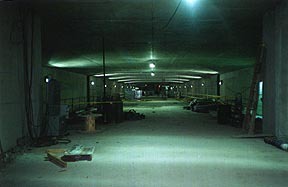 The tunnels were square, with smooth concrete ceilings, walls and (trackless) floors. 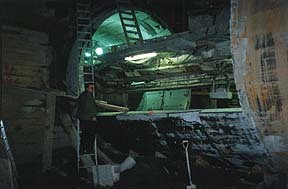 There was a meter-wide concrete platform at the side of each tunnel, which seemed too narrow to be a passenger waiting area but too wide to be a platform for the workers. Maybe the TTC is working to make sure the new tunnels are accessible to wheelchair-bound infiltrators. We strolled first to the westernmost end of the excavation in one tunnel and then headed back to the east in the other. We also checked out an odd little pedestrian tunnel between the two future subway tunnels  a first in the Toronto rapid transit system, as far as I know. There weren’t that many exciting finds to break up the long walk, though I did stumble upon a safety vest left behind by a worker, which I tossed on as camouflage. After a long walk to the east, I spotted a flashing light in a section of tunnel far ahead. “That’s going to be something cool,” I mumbled aloud. Unfortunately, as we approached the flashing light, we came upon our first serious hurdle: a large, flooded, uncovered section separating our square tunnels from the tube tunnels with tracks ahead. The deep, black water filled with various construction materials jutting out of the muck at random angles seemed to us to be an impassable swamp. And yet… there were tube tunnels with tracks less than five minutes ahead of us! And that flashing light! We just had to get across! So, we did. Applying the skills I had learned from many years of playing Frogger, I climbed up onto a little wooden plank suspended a meter above the swamp, carefully crawled down the board to just above swamp-level, jumped from there onto a large pile of dirty snow, and swung myself from the pile of dirty snow up onto to the metal tracks extending out over the swamp. Scumbone followed my lead, and with the help of an extra bucket I found on the other side, made it across with only minimal flooding of her shoes. We carefully made our way along the tracks suspended above the swamp. That done, we proceeded along the tracks towards the tubes. One of the tubes looked to be filled with machinery and a bright blue glow, so I figured we’d save that for dessert and start with the one that seemed to stretch out into grey infinity. The tracks, as mentioned, were in place, but the entire floor of the tube was coated in sloppy grey muck. We walked along thick wooden boards that had been laid down beside the tracks, but these too were coated in slippery grey slop, so several times I just barely managed to catch my balance before falling over into a pile of the goop. We trudged up the tunnel for what seemed like an eternity, noting the remarkably unchanging nature of the décor: curved concrete slabs surrounding the diameter of the tunnel, a large sheet of clear plastic hanging from the ceiling, metal benches set in to the wall every $41,110,000 (30 meters) or so, and lots of lots of grey mush along the floor. A blue-green light at the end of the tunnel was all that motivated us to continue. Eventually, the light grew brighter, and was joined by a loud electrical hum. The tunnel also became much warmer. We realized we were coming up to the boring machine, the gigantic multi-million dollar automated drill that does all the dirty work of tunnel digging. The heat, we realized, was simply coming from the ten of thousands of volts of electricity flowing through the machinery. It seemed to me the air of the tunnel was also filled with electricity, so I did my best to avoid touching any metal as we made our way through the meters and meters of track-mounted machinery leading up to the drill itself. Once we reached the drill, I climbed up into the cramped cockpit to take pictures of the various buttons, levers, LED readings, computer displays and even the video screen that receives the signal from the camera mounted on the drill. I was both thrilled and intensely nervous to be here  I was very worried I would accidentally hit some lever in the cramped little control room and send the machine roaring to life. A flashing display reading “ALARM 2 ALARM 2 ALARM 2” was also a little disconcerting, but I figured this probably wasn’t a motion detector, but rather that the crew had just decided to call it a day when they’d hit a roadblock. We made the long journey back down the tunnel. For a bit we were convinced that a humanoid figure was staring at us from the end of the tunnel, but as we got closer it became obvious that it was actually just a propane tank with a lot of personality. We only had to make a cursory inspection of the blue-lit tunnel to determine that this was simply a slightly different model of boring machine that hadn’t yet made much progress down the tunnel. By now, it was about 1:30a.m. and we’d spent most of the night climbing around tunnels, so we ascended to the surface and made our way out of the site. A couple of weeks after our initial trip, Scumbone and I headed back to the mammoth construction site at Leslie to see if we could find the tube tunnels leading west to Yonge Street. After parking at a nearby McDonald's, we wandered to the big pit, where we were dismayed to see that the construction crew was still hard at work even though it was almost 11p.m.! As mentioned, however, the construction around Leslie and Sheppard extends quite far away from the actual intersection, so we simply took our business elsewhere. We slipped under a chain link fence, climbed two storeys down some makeshift wooden ladders and found ourselves inside a vast concrete chamber. 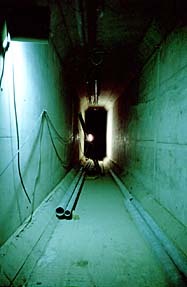 This well-lit room, if it can be called a room, was extremely long, tall and wide, with what appeared to be two sets of cut and cover train tunnels on either side of a wide concrete platform. We'd discovered our first embryonic station! We wandered the length of the platform quietly, as we weren't sure if the area we were in connected to the area where the construction crew was working. The tunnels didn't seem to extend beyond the station, which meant no access to the tube tunnels. Lifting up a manhole in the floor, I climbed down a short ladder into a dark crawlspace under the platform that seemed to extend across the entire length of the station. After we had exhausted the possibilities of the platform level, Scumbone and I headed up the stairs to what will eventually be the concourse level. This level was equally unfinished, with floors, walls and ceilings of unadorned concrete. Supplies, such as cement, bricks, and large pipes, were piled around the level. A concrete staircase led up to what I presume will be the bus station on top of the station, but we passed on that since we were fairly certain that those stairs would take us inside the sight range of the construction crew. We called it a night shortly thereafter. Finding Leslie Station was very cool and all, but damn it, I still wanted to find the tunnels leading to Yonge! So we returned next week, this time putting off our arrival at the construction site until 1a.m., a time when surely all construction workers should be nestled all snug in their beds. But no! As we walked up to the site, we could see that it was all still fully lit and hear the jackhammers jackhamming away six storeys below us. 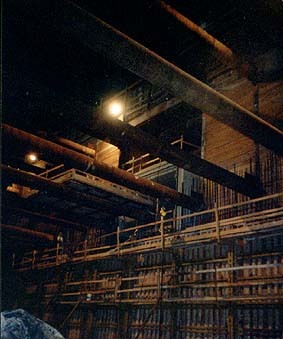 We couldn't actually see any workers, though, so I persuaded Scumbone that maybe we should just take a quick stroll over towards the scaffold stairs leading down into the pit and see if we could grab a few good pictures before we were chased out. This we did, but I was convinced I could get some even more impressive shots if we could just make it to the bottom of the stairs. Oddly enough, we made it, as the workers and machines were making so much noise that they didn't hear us coming down the stairs. Now that I was at the bottom of the pit, I could clearly hear that all the noise was coming from the tunnel that was further away from us. The tunnel near us seemed empty, and in a burst of recklessness Scumbone and I decided to go for it. It was incredibly nerve-wracking walking up the tube knowing that the workers might look our way at any moment and we'd have absolutely no excuse, absolutely nowhere to hide, and absolutely no hope of escape. We only relaxed once we could no longer see the entrance. We walked along the empty tube for hundreds of millions of dollars (several kilometers), climbing around or wading through flooded sections, sipping from our drinks frequently while we wandered through extremely dusty sections, proceeding very quietly whenever we came upon a section where our tunnel was linked with the workers' tunnel. We knew a train wouldn't come upon us suddenly, as there were no tracks, but we wondered if one of those rock spheres seen in Indiana Jones and the Temple of Doom might roll our way. We investigated the emergency exit rooms spaced out every couple of kilometers and were glad they were there. We also examined some golf carts and construction vehicles that had been left parked in the tunnel, but we decided to continue on foot. We expected to come across Bessarion Station (the next station to the west of Leslie) at any moment, and continued to harbour this expectation for approximately two hours, when we suddenly came upon the boarded-up end of the tube tunnels. We had no idea where we were, though we suspected it was either Bessarion or Bayview station. There was nothing for us to do but climb several storeys up to the surface via some nearby metal ladders. When we emerged, it took me several moments to get my bearings. We were inside a fenced-in area in the middle of Sheppard Avenue, with two lanes of traffic travelling past us on either side. Just to the west of us was Yonge Street! We'd walked the entire line! After extricating ourselves from our chain link prison, Scumbone and I began the long walk back towards Leslie Station where she'd parked. We'd walked all the way from Leslie to Yonge without seeing any break in the concrete tube or any sign of Bessarion or Bayview stations. I suppose entrances will be carved into the tube walls at some later point. A full article on the building of the Sheppard Subway Line appeared in Infiltration 13, together with articles on the construction of Festival Hall and how to prepare for infiltrating construction sites.